An intimate conversation between two people, stretched across the city, situated up to 500m apart. 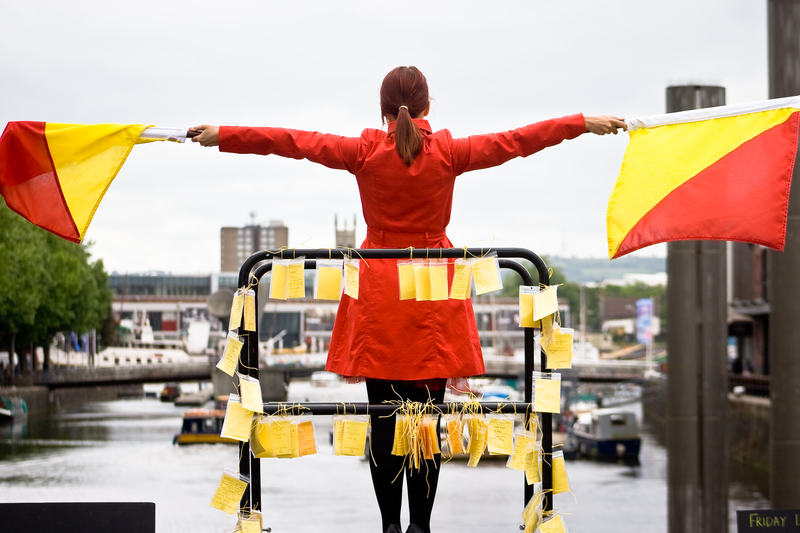 For 5 hours over 1 day, Search Party will create a live semaphore soap opera for Preston. Using giant flags instead of spoken words, this rolling and improvised narrative will communicate playfully across the city’s landscape, exposing stories that are hidden and encoded that simmer beneath the surface. Search Party decipher their intimate exchange of secrets, half-truths, veiled threats and warnings; documenting the conversation as it unveils and revealing what is too often left unsaid.Passers-by leave personal stories, which become part of the accumulative dialogue, transforming the two parallel sites into impromptu memorials of shared love, loss and separation. Commissioned by Mayfest & Theatre Bristol. Development supported by Rules & Regs, Home Live Art & The University of Chichester.